Raspberry and chocolate are two flavor combinations that are just meant to be so it only makes sense that Hershey's makes raspberry hugs. Which brings me to Valentine's candy. I mean, how cute is Valentine's candy?! Something about heart shaped chocolate all wrapped up in cutesy pink and red wrappers....I don't know, it's just more irresistible for me that way. So, of course, I can't resist walking down the Valentine's Day aisles at stores and picking up cutesy candy. Another thing I couldn't resist buying was the new Hershey Spreads. Have you seen these things? Seriously, it's like therapy in a jar! Insane. In a large mixing bowl, combine the flour, both sugars, cocoa powder, baking soda, salt, shortening, chocolate spread, milk, and vanilla extract and mix until combined. Add egg and mix until incorporated and a stiff dough forms. Roll the dough into about 1-inch balls and then roll in granulated sugar. Place about 2 inches apart on a parchment or silicone mat lined baking sheet. Bake the cookies at 350 degrees for about 9-12 minutes. Be careful not to overbake. As soon as you remove the cookies from the oven, top each cookie with one candy, pressing down to make sure the candy stays on the cookie. Carefully remove cookie from baking sheet onto wire cooling rack, allowing plenty of cooling time for the candy to set. This recipe made a little over 2 dozen cookies for me. I'll take therapy in a jar! (that is kind of how I feel about peanut butter :) The crackles in your cookies are gorgeous! 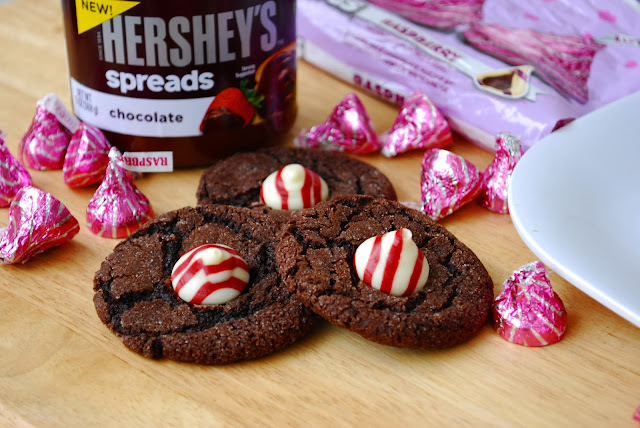 OMG, what the heck is Hershey spread? And why have I never heard of it before??? Those cookies look amazing Shannon! !